Ankle pain is an extremely common complaint, and there are many causes. It is important to make an accurate diagnosis of the cause of your symptoms so that appropriate treatment can be directed at the cause. Make an appointment today to find the cause of your pain. 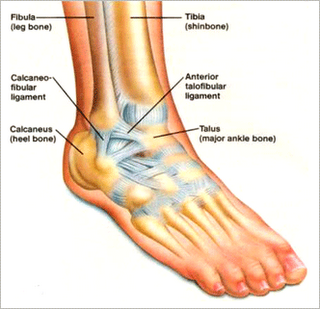 Injury to any of the bones, ligaments or tendons in the ankle can cause ankle pain. A sprain/strain is the most common cause of ankle pain. This occurs when your ankle rolls over your foot and this may cause your ankle ligament to stretch or even tear. Sprians/Strains can occur when you walk on an uneven surface or simply take a misstep. If injury doesn’t respond to self-treatment in two weeks, make an appointment. Ankle pain is treatable depending on the diagnosis. Without care, scar tissue may build up which will limit your range of motion and increase pain. You should get back to your active lifestyle without the constant pain. A very effective method of treatment has been found to be A.R.T., Graston therapy, combined with heat and cryotherapy. Rather than just addressing just one area, ART® restores unimpeded motion and function to all soft tissues. Graston therapy is a soft tissue technique aimed at breaking up scar tissue and adhesions to promote the rebuilding of scar tissue in the correct line of force to strengthen the muscle, increase flexibility and movement, and promote normal function of the soft tissue. Graston therapy incorporates the use of stainless steel tools that are used to detect and treat scar tissue within muscles, ligaments, tendons, fascia, and all other forms of soft tissue. By breaking up this poorly formed scar tissue and encouraging the body to form healthier and stronger scar tissue, the muscles and ligaments in the ankle will be allowed to move properly and will no longer be irritated, inflamed, or painful. We will also show you exercises and stretches for you to do to increase your proprioception and strength. Kinesio tape will also be applied over and around muscles in order to assist and give support or to prevent over contraction, affecting change in deeper layers of fascia by manipulating the skin and muscle and creating space underneath the skin to.